No doubt incredible science has been done with the Cassini spacecraft. Enhancing the knowledge of our solar system. Yet there is a dark side to ending the Cassini mission by plunging it into Saturn. What will to happen to the nuclear fuel used to power the craft? An isotope called Plutonium 238 which is made from a by product of nuclear weapons manufacture and is very expensive to produce. Pu-238 has a half-life of 87.7 years. Plutonium 238 is enriched with 16% Plutonium 239 which has a half-life of 24,110 years. Cassini is set to vaporize into Saturn’s atmosphere on September 15, 2017 with 72 pounds of Plutonium 238 on board. The most ever packed onto a spacecraft. Used to electrically power and heat Cassini by radioactive decay in thermoelectric batteries. It is not the more fissile form of Plutonium 239 spheres employed in nuclear weapons. There is no risk of a large nuclear explosion as some have suggested. However a nuclear explosion would be radiologically far cleaner to what will actually happen. The wide dispersal of radiological contamination over an entire planetary ecosystem! Even if no life exists on the gas giant. Should humans be contaminating Saturn with what is arguably the largest “dirty bomb” ever constructed? The entire national stockpile of Plutonium 238 is only at 86 pounds with 36 pounds set for future space exploration. A whopping 72 pounds is packed on Cassini. The most Plutonium 238 ever put in one place at one time. One of the most dangerous substances known to man, in the largest quantities, will vaporize into the atmosphere of Saturn. Burning up the spacecraft into the gas giant’s atmosphere. This amount of Plutonium 238 ensures that the entire planet will be significantly irradiated even though Saturn is much larger than the Earth. “Theoretically, if one pound of plutonium dust distributed equally into all lungs of people on Earth would kill everyone.” Dr. Helen Caldicott MD. When Cassini was originally launched in 1997 there were protests against such a large amount of Plutonium 238 being lifted off from Cape Canaveral in Florida. The largest amount ever launched. If the rocket exploded before it got into orbit the entire state would be contaminated. This would have been a less severe occurrence than a total vaporization as in a reentry scenario. The protective containment for the Plutonium 238 most likely would have held together. Preventing wide spread contamination. Yet it still would have been a major disaster according to Dr. John Gofman, who isolated isotopes for the Manhattan Project. It would be a much worse case if Cassini were completely vaporized at high speed as it will be with Saturn. This is what is in store for Saturn as 72 pounds of Plutonium 238 is set to completely vaporize as it enters the planet’s atmosphere at High Speed . Making sure every part of the craft is completely destroyed. Including the Plutonium 238 and it’s containment vessels. Nano particles of Plutonium 238 will spread widely across the entire planet. Some evidence of the effects of Plutonium 238 being spread over planetary ecosystems were looked at in the environmental impact study done for the Cassini launch. As well as experience from military satellites containing Plutonium 238 that have vaporized in our own atmosphere! Space agencies already have expertise with irradiating other planetary systems other than our own. Plunging the Galileo spacecraft containing 17 pounds Plutonium 238 into Jupiter on September 21, 2003 at a speed of 108,000 mph. Currently there are 34 satellites orbiting Earth right now filled with Plutonium 238 and 239. All on degrading orbits that will eventually come back down. As 8 have since 1964. No animal or plant on Earth could be measured for Plutonium 238 until the 1964. That’s when a satellite containing 2.1 pounds of Plutonium 238 fell to Earth. A Defense satellite using the SNAP 9A plutonium power system failed to make orbit and vaporized on reentry. Now every plant and animal on Earth can be measured for this deadly substance. This one event was just 2.1 pounds of Plutonium 238 dispersed as fine particles over the Earth. Over the years since then 7 more spacecraft containing Plutonium 238 have fallen back to Earth. Adding to the total amount of Plutonium 238 contained in your body. Dr. John Gofman, professor of medical physics at the University of California at Berkeley, has linked this one accident to an overall increase in global lung cancer. Studies indicate this one event doubled Plutonium 238 content in the world’s southern oceans. Undoubtedly much more havoc has been caused by the contamination left over from these accidents than will ever be known. The environmental impact study done by NASA for the Cassini mission titled “Final Environmental Impact Statement for the Cassini Mission” states some of the reality in the event of an inadvertent reentry on Earth by Cassini. As it made a close pass by Earth at high speed. Imagine how this would effect another world. One we know very little about. NASA states deaths over a 50-year period could be 2,300. That would be a low ball of course. Other scientists don’t agree. This would not even be near the real estimate of total deaths. According to Michio Kaku, a professor of physics at the City University of New York, Ernest Sternglass professor of radiological physics at the University of Pittsburgh School of Medicine and John Gofman, professor emeritus of medical physics at the University of California. All concur that far more damage would be done if 72 pounds of Plutonium 238 were vaporized in Earth’s atmosphere. Kaku estimated 200,000 deaths, Gofman projected up to 1 million, and Sternglass suggested 40 million in the event of a dispersal of Plutonium 238 from a Cassini reentry on Earth’s atmosphere. This referring to the close fly by of Earth, just 700 miles, that Cassini had to make in order to gain enough speed to reach Saturn. Not good scenarios. One wonders if an environmental impact study was done for Saturn? No one knows what the planet’s ecosystem is or if there may even be microbial life present in the clouds of the gas giant. No one really knows. Why would NASA contaminate this world even if there was nothing there but just plain old Saturn? It would have been possible for the mission planners to accommodate for a safe trajectory out of the planetary orbital plane. Where it wouldn’t collide with any scientifically important object. Save a little gas for the trip out of the planetary plane into a safe orbit. As was done with Voyager One which contained Plutonium 238. Yet going by NASA’s own statements about the reason for the plunge of this “dirty bomb” into Saturn shows a complete reversal of logic. NASA wants to do some more science by testing Saturn’s atmosphere. 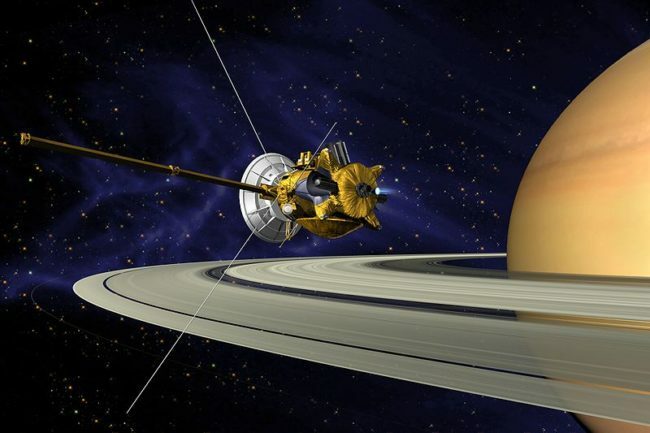 Stating that leaving the Cassini floating around on a “graveyard orbit” would increase the chances (how ever small) of the spacecraft colliding with one of Saturn’s icy moons. There by contaminating them with Plutonium 238 and possible microbial life from Earth! What about Saturn? The same reason was given for Galileo spacecraft contaminating Jupiter with 17 pounds of Plutonium 238 in 2003. Mission planners could have avoided this if it was a priority. NASA is violating it’s own prime directive by contaminating other worlds with a by product from nuclear weapons. This is the unfortunate reality of the matter. How ever great the science achieved. “For one, there is no life in Saturn (unless you are an evolutionist). It has no ecosystem! And plutonium only kills animals with lungs who breathe it in.